Increasing pressure on water supplies in crowded, historically hostile, nuclear armed region. What could go wrong? Droughts are becoming more frequent, creating problems for India’s rain-dependent farmers. At the same time, disputes between states are on the rise. Interstate disagreements are on the rise, with seven major disputes currently raging, pointing to the fact that limited frameworks and institutions are in place for national water governance. The report said there are seven major ongoing disputes over water resources, which highlights the limited framework and institutions for water governance. Nearly 163 million of India’s population of 1.3 billion lack access to clean water close to home, the most of any country, according to a 2018 report by Britain-based charity WaterAid. bout 600 million Indians are facing high to extreme stress over water, according to theComposite Water Resources Management report by the government’s policy think-tank Niti Aayog this week. The comprehensive study on the state of India’s water warned of conflict and other related threats, including food security risks, unless actions are taken to restore water bodies. “Critical groundwater resources, which account for 40 percent of our water supply, are being depleted at unsustainable rates,” the report said. More than 20 cities, including New Delhi, Bengaluru and Chennai, will run out of groundwater by 2020, affecting 100 million people, according to the report. Agricultural baskets, states that are home to 50 percent of the population, are the low performers in the government policy body’s Water Index, that could pose a “significant food security risk” for India. “What this report says was true 15 years ago, now the situation has worsened. 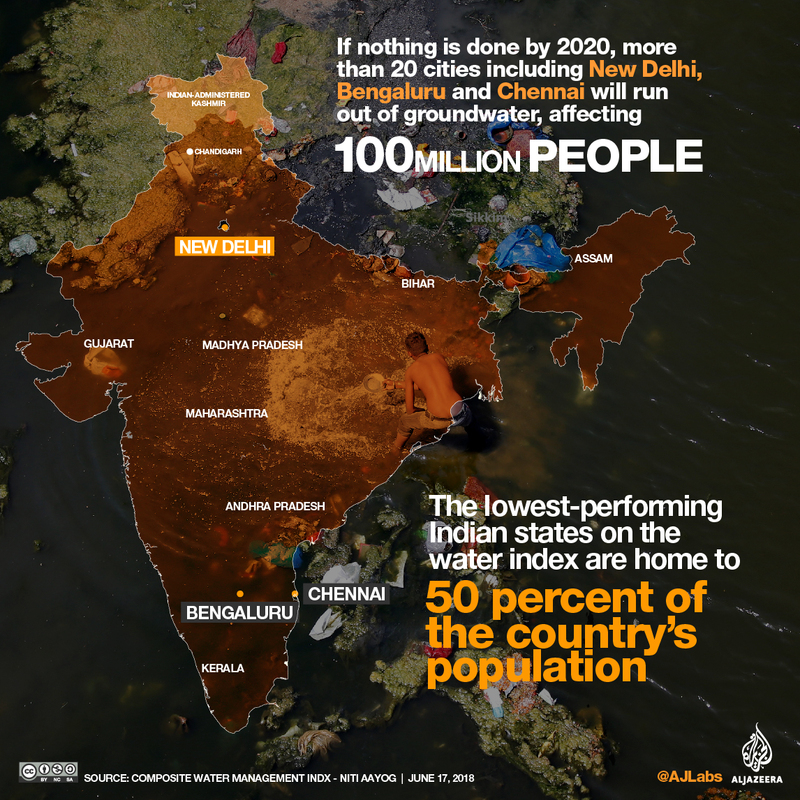 Ninety cities in India do not have enough clean drinking water now to sustain its populace,” Rajendra Singh, a water conservation activist known as India’s “Waterman”, told Al Jazeera. “Part of this is because of the rising temperature, and the changing rainfall patterns that come with the changing climate,” author Ramesh said. “Part of it is because of unwise choices we have made in managing our waste and water – dumping our waste in canals, or streets – blocking the drains and reducing the canals for instance. Or building over water bodies,” she added. SHIMLA, India — The people of Shimla haven’t agreed on much lately. A drought in the Himalayan resort has had residents blaming farmers, the tourism industry and one another for depleting the strained water supplies. And everyone’s been angry at the key men. Shimla’s decrepit network of water pipes, built under British colonial rule more than 70 years ago, depends on the civil servants known as key men to open and close the valves that supply each neighborhood. The current shortage, which in May left some homes without water for 20 days, has led to such fury toward the key men — accused, in just about every neighborhood, of depriving it of its fair share — that a court ordered police protection for them. “I was getting angry phone calls calling me everything — stupid, worthless — at one or two in the morning,” said Inder Singh, 44, who has been a key man for 24 years. “I would be mobbed by dozens as I was trying to leave my home for work,” he said, inserting his key — a meter-long metal contraption — into the ground to open a valve. “There’s global warming all over India, and Shimla is no exception,” said Vineet Chawdhry, chief secretary of the state of Himachal Pradesh, whose capital is Shimla. But the city’s ancient pipe system also leaks five million liters of water every day, Mr. Chawdhry said in an interview in his office. A $105 million, World Bank-backed upgrade of the system, including a pipeline drawing water from a nearby river, is scheduled to be finished in 2023. The strain on the water supply increases greatly during the summer tourist season, when Shimla’s population essentially doubles. In the summer months, Mr. Chawdhry said, the city typically needs 45 million liters a day. He said the current daily supply stood at 31 million liters, and at the height of the crisis in May it was as low as 22 million. <p>Shimla is not the only Indian city whose water supplies are under increasing pressure. Last year was the country’s fourth hottest since record-keeping began in 1901, with rainfall down by nearly 6 percent from 2016, according to the Indian Ministry of Earth Sciences. My video below is an interview with two globally known glacier experts, who discuss the shrinking of mountain glaciers, and impacts on the crowded, nuclear armed states in Asia. That’s only a year and a half away. “If nothing is done by 2020…” (or 2022, or 2025-1/2) Ho-Hum….. I have often touted the book Fire and Ice here (Jonathan Mingle, 2015), which does a great job exploring the science and particularly the cultural aspects of glaciers in the Himalayas and societal failures in India. It will soon be SHTF time there, and we and they are doing next to nothing to head it off (except perhaps aggravate the Chinese with insane trade wars, which may make them less likely to listen to us when India, Pakistan, and China start thinking about throwing nukes at each other). Reading another good book by Curt Stager—- Still Waters: The Secret World of Lakes (Norton, 2018). Stager visits lakes around the world, and talks about Lake Victoria having dried up about 17,000 years ago during a time when the African and South Asian monsoons failed because of some drastic short-term climate change. Considering how much we are screwing with the climate, it is not impossible that the monsoons may fail again, putting three or four billion people in “high to extreme stress” over water shortages. FIVE downvotes for my comment from the Musk sheeple—-an impressive demonstration of how a BS artist can take over the minds of otherwise intelligent people. What’s next? A Church of Elon where he can be properly worshiped? In the meantime, would anyone care to talk about all the OTHER points I made and the thrust of this Crock post—-you know, the HUGELY serious water problems developing in South Asia and the complicating factor of ~500 nuclear weapons being held by the major players? Time is running out, folks, and spending your time kissing Musk’s rear end is not going to solve the problem. Nice informative blog. You truly said day by day water crisis is increasing. Everyone stops wastage of water.